This meeting is free for veterans and their families who experienced harmful side effects associated with the use of Mefloquine. 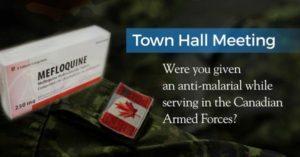 Join Veteran John Dowe and the legal team of Howie, Sacks & Henry and Waddell Phillips PC for this informative session, as we will help you identify some of the harmful side effects of Mefloquine, and whether you may benefit from taking part in the upcoming lawsuit against the Government of Canada. You can show up or save a seat by clicking here.